One cold winter day, Jeff decided to order a queen bee. Our initial hive began when a friend gave us a swarm and we’ve collected swarms whenever possible since then, but Jeff felt that catching swarms was too uncertain. We needed an influx of bees and so we were going to buy them. 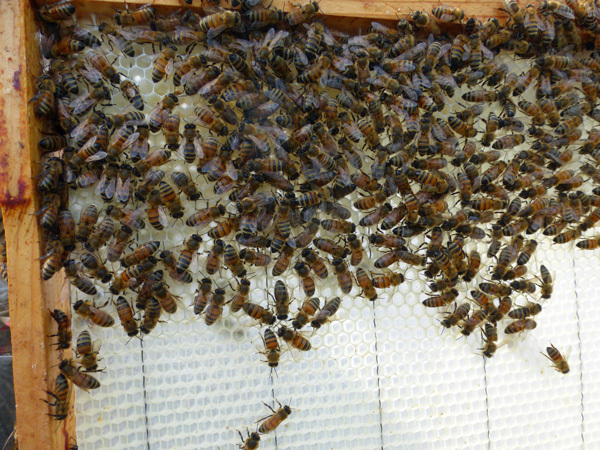 The order has to be placed early – queen bees sell out! He placed an order for two packages. Each package consisted of one queen with four pounds of bees. Yes this type of package can be sent through the mail, but since the source, (Vacaville), was not far from us, Jeff chose the pick up option. Our pick up date was set for a Saturday in March. Well, the date approached and we realized that Jeff would be at a racetrack in southern California. I would get the experience of picking up the bees and installing them alone. The pick up window was 8 to 10 a.m. That morning I had a nightmare about finding a fabric bag of bees in a freezer. Despite that, my departure had a great soundtrack; the local radio station, http://www.ozcatradio.com played Joan Armatrading’s Love and Affection. 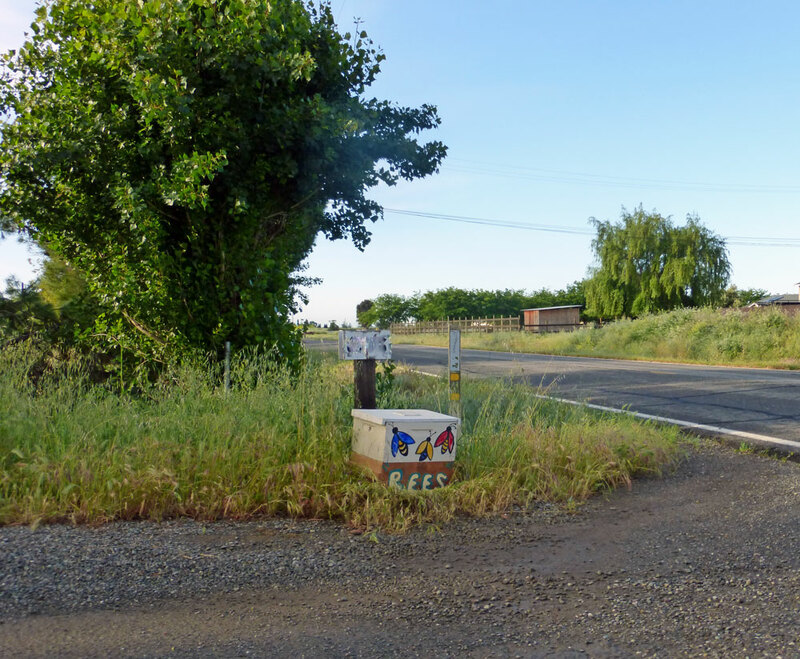 After that the drive was non-eventful, a slog east on 80, and then off into the wild flatlands north of Vacaville. I wasn’t looking for someone to hold my hand, but a little more instruction on how to install the packages would have been helpful. 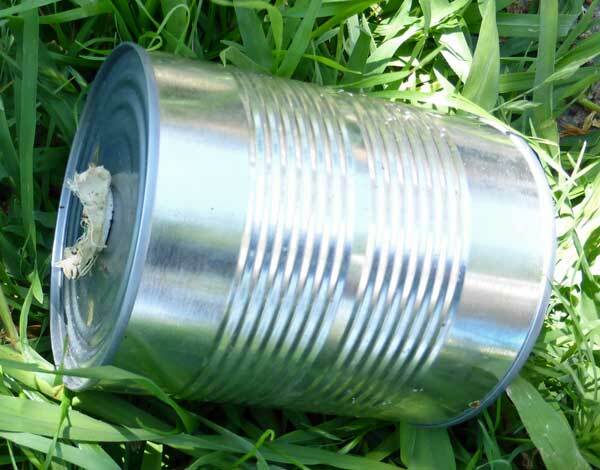 In retrospect, seeing the container that housed the queen would have been extremely useful. 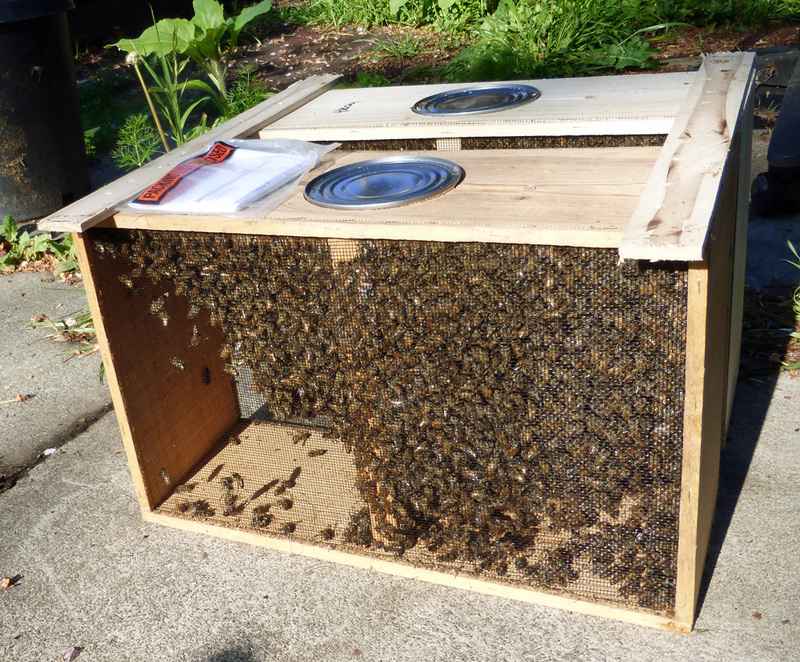 In the nuc the cage is hanging down next to the feeder; the queen is covered with bees. 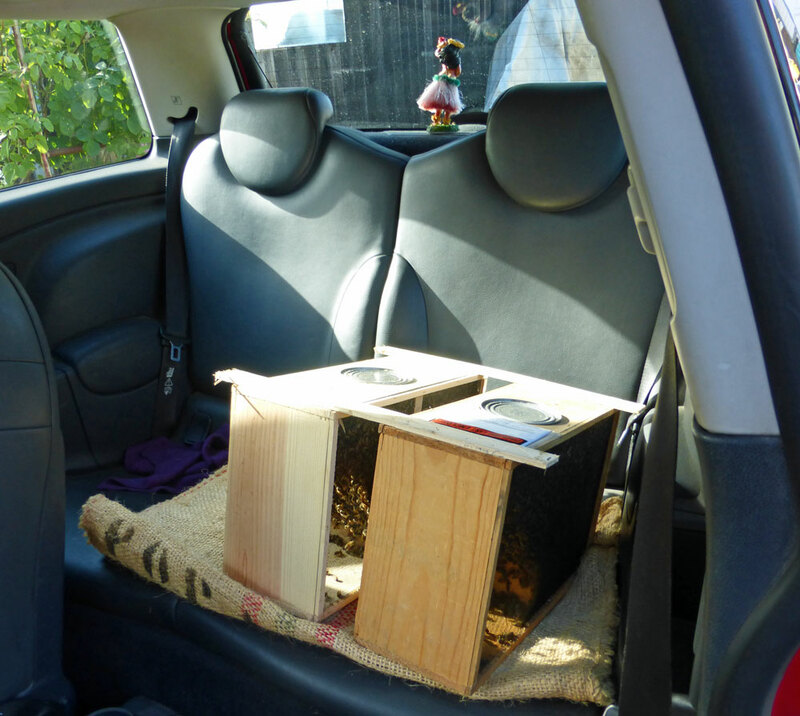 Step one: make sure you have the new home for the bees set up. We put hive bodies together with a mix of frames, everything from old comb to new foundation, entrance limiters and water. Step two: Wait until evening. This gives the bees a chance to bond with the queen. Also as the temperature cools at the end of the day, the bees are more likely to group together to stay warm. Step three: Suit up and gather your tools. The idea is to secure the queen’s cage at the top of a frame. I took the recommended push pins with me. These did not work! In retrospect, I think something to tie the cage to a frame, like twisties, would have been more effective. Step six: Look at the cage and figure out what is required to secure it to the top of a frame. Find the sugar cube and remove the cap over it. 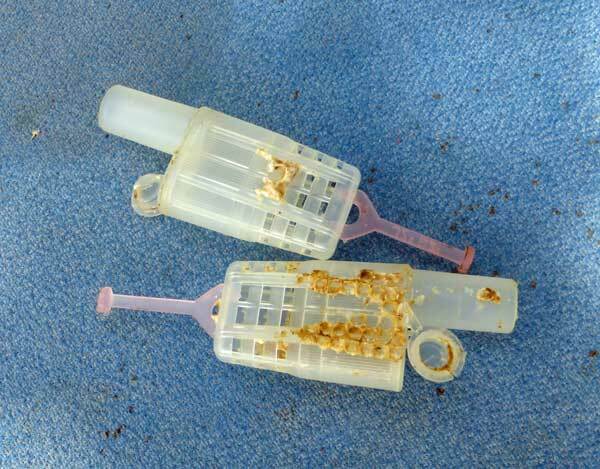 These plastic cages had an alternative cap that could be opened – that too be honest I didn’t see until we removed the empty cages. 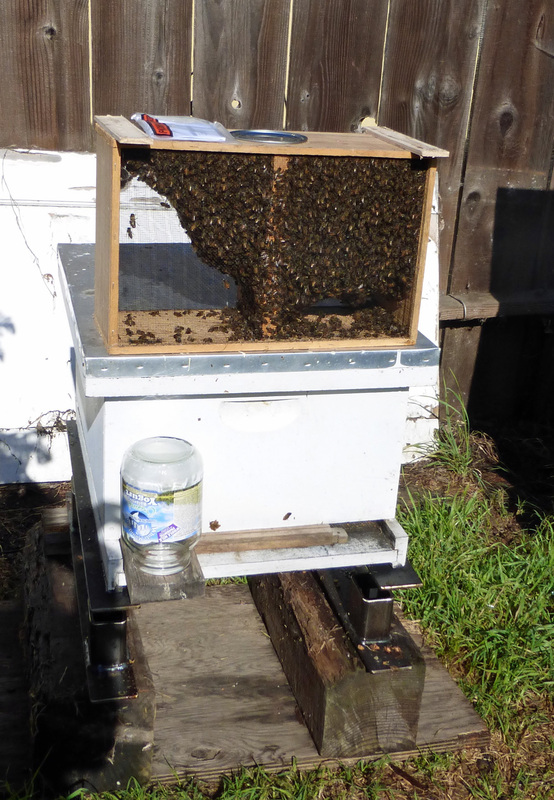 Step seven: shake the bees from the nuc into the hive. All this seems straight forward, but doesn’t capture my experience with the first package. After slamming the nuc down, the bees swarmed out, and I think bees from our established hive joined them. Four pounds of bees is a lot of bees when they are flying around you. Add to that the frustration of push pins that are not long enough to secure the queen cage and a queen that is screaming at you and you have a not pleasant experience. Both queen cages ended up near the bottom of the hives. Although package #2 was calmer, the air was still full of confused bees. Plus the bees don’t pour out of the hole in the middle of the nuc easily. If I were to do this again, I would have ready a variety of ways to secure the queen cage. I would not slam the nuc until I was ready to pour and I would remove one side and attempt to pour that way instead of through the middle of the top. Of course packaging changes so the important thing is to be clear on the goal. It’s important to give the bees a chance to release the queen from her cage and get settled before getting in the hive to remove the queen cell and measure success. Some sites recommend 5 days, but others say ten. Jeff and I opted for the longer time. During the week I noticed that our old hive appeared to be battling robber bees and there was a lot less activity at this hive than before the installation of the two new hives. It was as if it had swarmed, which is possible, but the timing seemed odd. 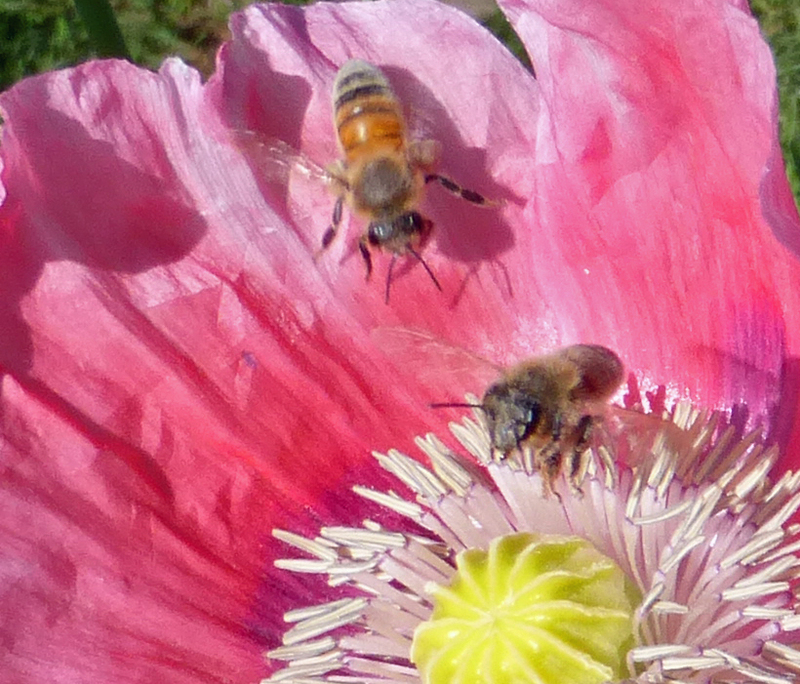 Also I noticed in our garden honey bees showed a new interested in the pink poppies. On day ten both new hives show healthy behavior. 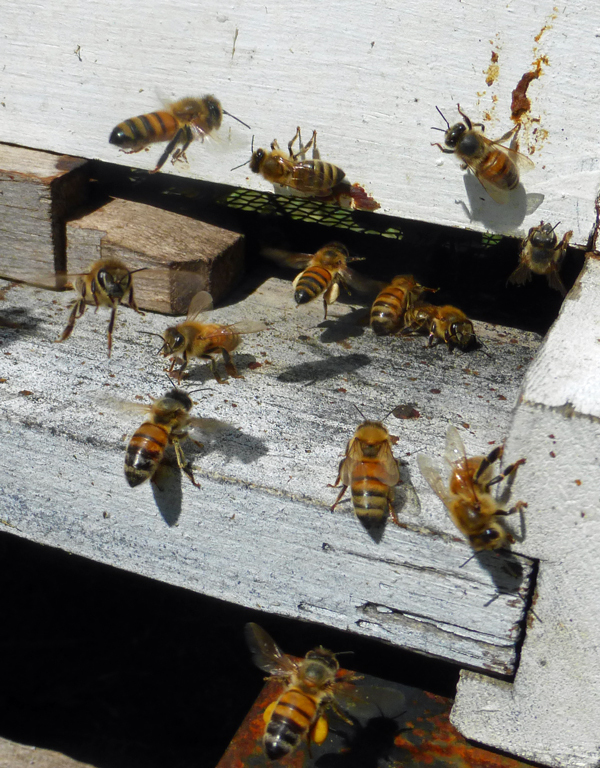 Worker bees are returning with yellow, beige and orange pollen. Comb has been built. The hive with the rowdy queen is the most lively. Interestingly, when Jeff and I opened the hive with the lively queen, the bees poured out of our old hive. Once we removed the empty queen cage and closed this hive, the old one settled down. I don’t understand the relationship between these two hives, but there appears to be one. After looking in the hives and removing the empty queen cages, I came inside and found the radio playing Joan Armatrading’s Love and Affection once more. This entry was posted in Bees and Honey and tagged bee, beekeeping, bees, honey, honeybees, installation of package bees, Lanora Cox, package bees. Bookmark the permalink. You’re much much braver than me. I was doing some science with (so she said) some dead africanised bees when one came back to life. I ran out of my studio yelling, “It’s alive, it’s alive” with the researcher behind me yelling, “It’s ok, it’s ok”. HAH! When it comes to bees, I do not act like a grown up. I act like Adrian Bolt in the 100 m dash! Thanks Jim. Other things, like interviews, scare me, but not bees.